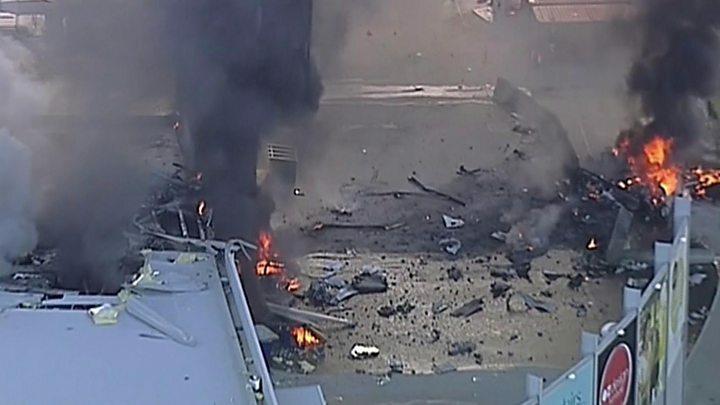 Pilot error was responsible for a small plane crash which killed five people in Melbourne last year, Australian authorities say. The plane hit a shopping centre after take-off, killing pilot Max Quartermain and his four US passengers. Two people on the ground suffered minor injuries. Aviation safety authorities said the plane's rudder trim had been in the wrong position, causing the crash. The problem should have been detected in pre-flight checks, they said. Passengers Greg Reynolds De Haven, Russell Munsch, Glenn Garland and John Washburn had been heading to visit Tasmania's King Island on a golf trip when the accident happened in February last year. Victoria's Premier Daniel Andrews said it was the worst civilian aviation accident in the state in 30 years. 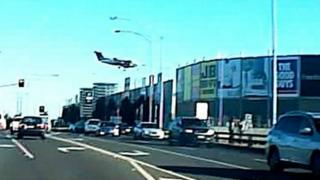 Mr Quartermain, an experienced pilot, issued seven mayday calls after taking off from Melbourne's small Essendon Airport. The plane was in the air for 10 seconds before it crashed into a Direct Factory Outlets (DFO) shopping centre. According to the Australian Transport Safety Bureau (ATSB), the pilot had "several opportunities" to detect that the plane's rudder trim was in the full nose-left setting. The rudder trim is located at the rear of the aircraft and helps control movement. It is set via a wheel in the cockpit. "The pilot's practices with regard to setting and confirming the position of the rudder trim, such as performing a function check, could not be established," it said in its final report released on Monday. The ATSB said the flight operator did not have an appropriate check system in place at the time of the accident. The report also noted that the Beechcraft B200 King Air's on-board weight had exceeded its maximum, although this did not contribute to the crash.